Anyone else feel like the primaries this year could air on MTV as another "REAL WORLD" Series? Just saying, this crew is seriously deficient in the "likeable" factor...I mean, look at this picture and tell me it does not make you think of some sort of alien invasion...Get some style gang! So next week is Mom Joan and Dad Vince's 60th Anniversary! Myself, my two siblings and our spouses are all heading down to Boynton Beach to celebrate the big day. A friend of mine asked me if Nancy and I would make 60 years. I laughed and said, even if we did, at 115 years old, I probably would not even remember the date! Then in April, Nancy and I head back to Tampa for another Fraternity reunion. This will be the 34th Anniversary of the first Commack Clambake which was held at the aforementioned parents home on Long Island. Those were some wild days! One Sunday my high school friend Bob walked onto the property and into the house wearing his NYC police uniform! You could not keep me from laughing as many people scattered and hid items... What a blast. We did this three years ago and had a great time and this should be as much fun. Busy couple of months, but so much fun! Clambake, Florida., Mom and Dad Anniversary, TKE. Sadly, I have come to that point that I have very little use for politicians, regardless of party. They have lost all sense of reality. None of them, regardless of party, are interested in doing the right thing for this country. They are only interested in doing what will get them elected. It's all about the power and nothing about the people. Unfortunately, good people won't run for office any longer. Okay, I'm through preachin' now. Congratulations to your parents on their 60th Anniversary. Have a great week sir. I am glad each day I wake up and Obama is my president. The other day when McCain was giving his "Let's Bomb Iran" speech I was reminded just how lucky we are that John McCain isn't president. 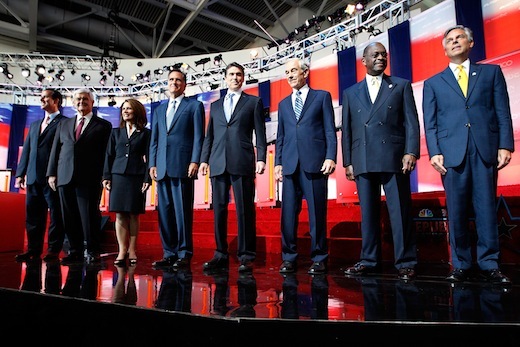 Also, I've never seen a more unlikable group of people running for either party's nomination since Richard Nixon ran. Count me with Phrankie too. I may not always agree with Mr Obama, but at least he understands that he is the President of all of us.